The American Dream is based on getting your hands dirty and doing the task yourself to achieve what you want. Being able to change a tire or paint the dining room is as cost-effective as it is patriotic. When it comes to installing drywall, however, a lot of factors need to be taken under consideration. AZ Drywall Finishing is your go-to drywall company in Illinois. We’re proud to train and certify the best drywall contractors for your Chicago home or business. Our team is here to show you why drywall installation is best left to the professionals. Focusing on detail, quality, and results helps us to meet and exceed the high expectations of our customers. While we know that do-it-yourself drywall work may seem like the best approach, this blog will beg to differ. Today, we’ll look at a few key concepts that show why our residential and commercial drywall company is perfect for constructing or remodeling your place! It’s hard to argue with professional results. Our drywall installation and finishing services provide the smoothest, most seamless surfaces, delivering the best in aesthetic quality. Based on the project at hand, your drywall needs will vary in terms of scope and difficulty. When the final product does not meet the highest standard of quality, people notice. As the proprietor and cashier of this drywall installation project, you’ll certainly notice any areas that are lacking in perfection. Doing the job right the first time is our specialty, saving you both money and time costs to start over again. The adage that time is money can be seen as quite the true statement. Without the best training and tools for drywall installation, your project can end up engulfing huge blocks of time. This can be even more true if mistakes need to be repaired or sections appear to need replacement. Our professional drywall contractors have skills and equipment to get the job done quickly, restoring your home or business back to normal in as little time as possible. Not only will your project be done in a quick and efficient manner, but the services will free up your time to focus on other endeavors. This convenience alone can be enough for some citizens to contact their Chicago drywall contractors right away! AZ Drywall Finishing is your source for the best drywall installation services in the industry. 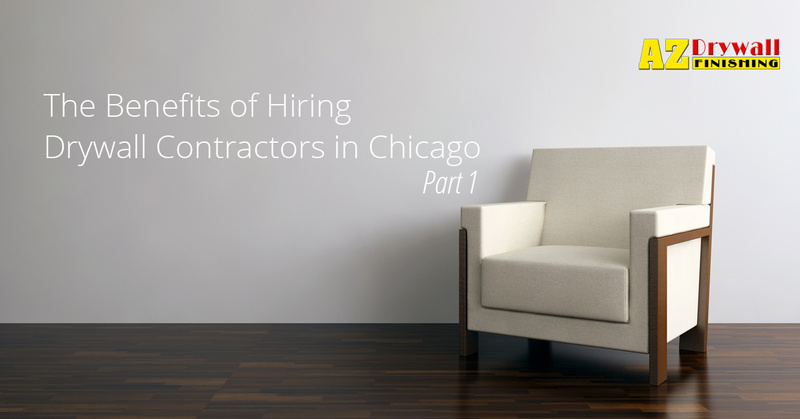 Next time, we’ll look at a few more benefits that you can expect when hiring professional drywall contractors for your Chicago home or business. If you are in need of any drywall, framing, or insulation services, we can help! Our experts have the skills and tools to complete the job with a focus on quality and cost-effectiveness. Contact us today for a quote on your next project!